Freight prices shown on this site are for the continental U.S. only. We will do our best to protect your order when we ship it out. All hitches that can be boxed will be boxed in a double wall box. Those that cannot be boxed will be wrapped with protective wrapping where possible. Please note that due to shipping inbound from the manufacturer and outbound to the customer, there may be scratches on these hitches. We will not accept returns due to these imperfections in the paint. Monday Thru Friday: 8:00am - 5:00pm EST. Holidays: We are closed all Major Holidays. and 150 miles north of Albany, New York. All orders in New York State are subject to 8% Sales Tax. 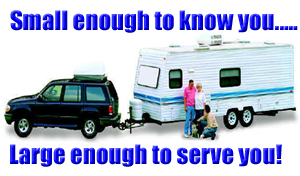 If you are a company for resale, please call us at 1-877-HITCH-IT (448-2448). 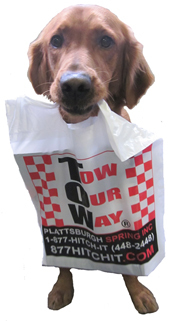 At Plattsburgh Spring, Inc. we take pride in your order. If you are unsatisfied with your order for any reason, we will do everything we can to rectify the situation. You must call and notify us before you return your order. Returns must be made within 15 days of the invoice date. * Any items drop shipped from the manufacturer cannot be returned unless it was a shipping error, or if it is defective. To find out if your order will be drop shipped from the manufacturer before placing your order, you can call us at 1-877-HITCH-IT (448-2448). * We cannot accept returns on used merchandise, electrical products, or special orders. * All returns are subject to a 15-25% restocking fee depending on the manufacturer for any return that is not an error of Plattsburgh Spring, Inc. or our website. * All Returns must be accompanied by a Return Goods Authorization Number (RGA #). Please call 1-877-HITCH-IT (448-2448) for authorization. Upon receipt & inspection of returned items and the sales slip, we will issue a credit to the credit card used to make the purchase. The credit will reflect the cost of parts only. The customer is responsible for freight charges. You will receive a copy of the credit in the mail. In the event that a return is the result of a mistake on the part of Plattsburgh Spring, Inc., we will issue a call tag, and refund the original freight charges. The products we sell are warrantied through the Manufacturer only. Plattsburgh Spring, Inc. gives no warranty for products not covered by the manufacturers Warranty, Limited Warranty or Limited Lifetime Warranty. PLATTSBURGH SPRING INC. HEREBY DISCLAIMS ALL WARRANTIES, EXPRESS OR IMPLIED, INCLUDING BUT NOT LIMITED TO ANY IMPLIED WARRANTY OR MERCHANTABILITY OR FITNESS FOR A PARTICULAR PURPOSE. Some states do not allow limitations on how long an implied warranty lasts, or exclusion or limitation on incidental or consequential damages, so the above limitations may not apply to you. This warranty gives you specific legal rights, and you may also have other rights, which vary from state to state. This warranty applies solely to Trailer Hitches, Drawbars, Receivers, Ball Mounts, Pintle Mounts, and Tow bars manufactured by Draw-Tite and sold under the "Draw-Tite" brand (the "Product"). 1. Warranty. Draw-Tite warrants to the original consumer purchaser ("You") that the Product will be free from defects in material or workmanship for Your lifetime as long as You own the Product. Draw-Tite makes no other warranties. If the product does not comply with the Warranty, Draw-Tite will replace the Product without charge and within a reasonable time or, at Draw-Tite's option, otherwise refund the purchase price. 2. Limitations on the Warranty. The Warranty does not cover the following: (a) normal wear and tear; (b) service or labor charges incurred in removing or replacing any Product; (c) the finish on the Product; (d) a Product that has been damaged through abuse, neglect, misuse or as a result of any accident or in any other manner; (e) a Product which is misapplied, overloaded, or improperly installed; and (f) a Product altered in any manner by anyone other than Draw-Tite. 3. Obligations of Purchaser. To obtain the benefits of the Warranty, You must promptly present the defective Product and proof of purchase to Draw-Tite, Inc., 40500 Van Born Road, Canton, MI 48188-2999, or any of its branches, factories, or authorized dealers listed on local directories. Any returned Product that is replaced or refunded becomes the property of Draw-Tite. 4. Legal Rights. This Warranty gives You specific legal rights, and You also may have other rights which vary from state to state. ANY IMPLIED WARRANTY OF MERCHANTABILITY OR FITNESS FOR A PARTICULAR PURPOSE ON ANY PRODUCT SHALL BE LIMITED TO ONE YEAR FROM THE DATE OF RETAIL PURCHASE BY YOU. Some states do not allow limitations on how long an implied warranty lasts, so the above limitation may not apply to You. 5. Remedy Limits. Replacement of the Product or refund in the manner provided above is your exclusive remedy and shall constitute fulfillment of all liabilities of Draw-Tite to You whether based on contract or otherwise. Draw-Tite shall not be liable or assume responsibility for the loss of the use of any vehicle, loss of time, rental of vehicles, loss or damage to personal property, expenses such as gasoline, telephone, lodging, or towing, or any other incidental or consequential damages incurred as a result of the use or ownership of any Product. Some states do not allow the exclusion or limitation of incidental or consequential damages, so the above limitation or exclusion may not apply to You. Any of the above remedy limitations shall be inoperative to the extent they are not permitted by applicable state law. This warranty applies solely to hitch accessories and vehicle accessories manufactured by Draw-Tite and sold under the "Draw-Tite" brand which are not specifically covered by other Draw-Tite warranties (the "Product"). 1. Warranty and Warranty Period. Draw-Tite warrants to the original consumer purchaser ("You") that the Product will be free from defects in material or workmanship for one year from the date or Your retail purchase (the "Warranty"). Draw-Tite makes no other warranties. If the Product does not comply with the Warranty, Draw-Tite will replace the Product without charge and within a reasonable time or, at Draw-Tite's option, otherwise refund the purchase price. 2. Limitations on the Warranty. The Warranty does not cover the following: (a) normal wear and tear; (b) service or labor charges incurred in removing or replacing any Product; (c) the finish on a Product; (d) a Product that has been damaged through abuse, neglect, misuse or as a result of any accident or in any other manner; (e) a Product which is misapplied, overloaded, or improperly installed; and (f) a Product altered in any manner by anyone other than Draw-Tite. 3. Obligations of Purchaser. To obtain the benefits of the Warranty, You must present the defective Product and proof of purchase to Draw-Tite, Inc., 40500 Van Born Road, Canton, MI 48188-2999 or any of its branches, factories, or authorized dealers listed in local directories within 13 months from the date of your retail purchase. Any returned Product that is replaced or refunded becomes the property of Draw-Tite. 5. Remedy Limits. Replacement of the Product of refund in the manner provided above is your exclusive remedy and shall constitute fulfillment of all liabilities of Draw-Tite to You whether based on contract or otherwise. Draw-Tite shall not be liable or assume responsibility for the loss of the use of any vehicle, loss of time, rental of vehicles, loss or damage to personal property, expenses such as gasoline, telephone, lodging, or towing, or any other incidental or consequential damages incurred as a result of the use or ownership of any Product. Some states do not allow the exclusion or limitation of incidental or consequential damages, so the above limitation or exclusion may not apply to You. Any of the above remedy limitations shall be inoperative to the extent they are not permitted by applicable state law. Draw-Tite gives no warranty for products not covered by Draw-Tite's Limited Warranty or Limited Lifetime Warranty. DRAW-TITE HEREBY DISCLAIMS ALL WARRANTIES, EXPRESS OR IMPLIED, INCLUDING BUT NOT LIMITED TO ANY IMPLIED WARRANTY OR MERCHANTABILITY OR FITNESS FOR A PARTICULAR PURPOSE.